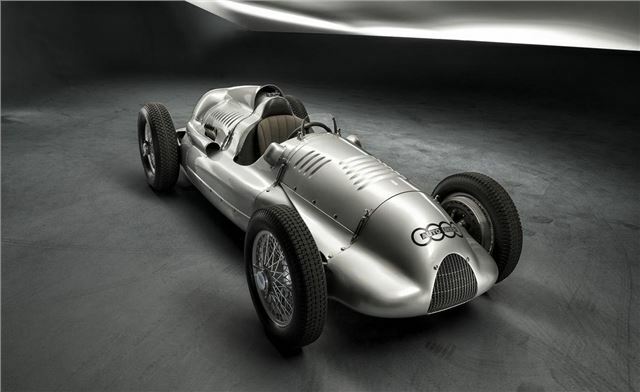 Audi has bought back one of the very few original Auto Union Silver Arrow racing cars, after it was lost in Russia for most of its life. The 1939 Type D twin-supercharger went missing after the second world war, when Auto Union’s home town was occupied by the Soviet Army. Auto Union was liquidated and the USSR took all but one of the Silver Arrow racers as reparation payments, after which they went missing. Auto Union, now Audi, thought there was no hope of finding them again. However, In the 1970s an American collector, named Paul Karassik, heard rumours that the Auto Union racers were somewhere in the Soviet Union. After ten years of liaison and numerous visits he tracked down two dismantled cars in Russia and Ukraine and managed to buy them. Gradually, with help from Audi, they were rebuilt. In 1998 Audi bought the first of the two rebuilt cars, which had to have entire new bodies constructed in the UK during restoration. The second was sold to a private buyer, but has now been bought by Audi. “This is one of the most emotional moments in our heritage work for AUDI AG – we have come full circle,” says Thomas Frank, Head of Audi Tradition. The return of the beautiful Type D twin-supercharger means that Audi now owns all three of the Auto Union racers recovered from the USSR – the first was recovered from a museum in Latvia after the Soviet Union collapsed. The Type D will be displayed in Ingolstadt, the home of Audi AG – but it will first make a guest appearance at the Goodwood Revival in the UK in September. Union GP car that was supposed to become the most expensive car sold at auction. creates more questions than it answers. racing car is mainly depending on its racing history as well as its traceable originality. Schroeder who asserts that he got documents. Did Audi approach this gentleman? Christie’s car and the fuss generated by a disputable identity. Bentley, Mercedes S Type or Ferrari GTO.